Followers, I’m so sorry I’ve been slacking in the blog posting. I know people wrote and wonder where the commentary was to the pictures, so here is my attempt to explain about the last 3 weeks of my time in Krakow. I have been busy, I’ll say that much. The first pictures are of the huge park right in front of our hotel. I usually try to run everyday and sometimes I decide just to run around the park because I know two times is 5 miles….but let’s be honest, more often than not I skip out on the second loop and just go for the 2.5. However, that is all backed up with a lot of walking. Which is needed because we eat all the time and are drinking full flavored beer. Randomly one day I was running and all the sudden a helicopter landed right in the park. Just another random thing to happen in Poland. Each year Krakow hosts a band for a HUGE free concert right on the river next to the Wawel Castle. This year happened to be Wyclef, who was awesome. The stage is set up across the river and there is actually not spectators on that side of the river. Everyone is one the other side, covering the banks of the river, the front of the Wawel and all along a nearby bridge. It was amazing. After the concert they have a huge fireworks show. These blow ours out of the water. It was like watching the grand finale for 20 minutes straight. The summer in Poland is known for music festivals and they are a good time. The pictures of me in medieval get up is from the National Museum of Krakow. We actually live two feet away from this building. It was actually a very bizarre museum, but Poland does have a lot of interactive exhibits. They are very into special effects and participatory tours and exhibits. I am sure my Mom is dying thinking about the amount of germs on those things. The rest of the museum was not very exciting. Maybe if I had someone there with more knowledge of what exactly I was looking at it would be more exciting. The communist tour was by far my favorite thing I’ve done in Krakow so far. In Krakow, there is an area known as Nowa Huta. This was a city planned by Stalin to be the perfect worker’s paradise. The city is now one of the most dangerous areas in Krakow. To start the tour we were picked up by Peter. He’s about 25 and a student. Giving the communist tours is his summer job. We did the deluxe package which meant that we were picked up in an original Trabant. These cars are made of plastic and as Peter said, would crush like a box if we were hit. This apparently didn’t concern him however, because his driving was quite freaky. Worst than driving with me on a bad day. But thankfully he reassured us by saying he got in a car accident last week. Not sure he should be mentioning that to his passengers/customers, but Peter was what we referred to as an oversharer. By the time we arrived in Nowa Huta we knew that his father had left his mother a year ago for a Thai masseuse that had worked for his brother. That didn’t stop him from recommending his Dad and new Thai mistress’s new Thai restaurant. We first stopped at the only restaurant back during communist times and the oldest in Nowa Huta. The Communist couldn’t afford to eat out, so this restaurant was for the “more equal” officers who could afford to eat here. We spent awhile here learning about the history of the planned city. We learned that the steel plant was were all the workers worked and that they all lived in apartments of the exact same size. It didn’t matter the size of the family. The steel factory buildings were built to look like buildings that would be in Italy because this was paradise after all. We went to an apartment set up as it would be during the Communist times. Many families had a machine in the bathroom where they would make their own vodka. That would be why there is a picture of us taking a vodka shot in the apartment…with no chaser because of course they had no juice. After about 20 minutes I finally recovered from that. Later we were supposed to go to the Milky Bar, which are restaurants that are subsidized by the government. In the past they used to be subsidized so “less equal” citizens could afford to go out to dinner and now they still are for the poor and students. However, Peter was very flustered and talked too long, so we actually got to the Milky Bar and it was closed for the day. Instead we had to go back to the restaurant and eat dinner. To end the tour, Peter took us to a parking lot to practice our driving skills on the Trabant. The stick shift is next to the steering wheel which made it interesting to drive. Later that night we went to the Jewish District were the Jewish Festival was taking place. There was an awesome band from Israel on stage and tons of traditional Jewish food cooking. We ate a second dinner (common here while traveling), which was amazing. Couldn’t tell you anything about what it was though. The Jewish District is a new up and coming area. My favorite place to go out. The next day we toured the Wawel Castle. It literally had been raining for the last couple days and this would last all the next week when Kelli Briggs was visiting. The Castle was interesting. We went to the Royal Apartments, one of the Towers, and the Dungeon. Later that day, Kelli arrived. Kelli fit right into the program because she came at the same time as other students who were only doing the last three weeks. Everyone thought she was just another person in our program. I had gotten a new roommate (thank the lord) and also had another person I knew from my law school class arrived. I took Kelli out to a traditional polish meal the first night. This entails a basement restaurant with Zurek soup and perigoes. I then took her out to the Jewish District. Kelli and I decide it would be a great idea to go on the Zyweic’s brewery tour. I used the same company and low and behold we had another personal tour guide by the name of Peter. Starting to feel like they just use that name to avoid our confusion at their Polish names. The Zyweic’s brewery was about 2 hours outside of Krakow. Peter was already 15 minutes late when he arrived. He immediately insisted he had to smoke a cigarette because he was really stressed. The first our of driving was terrifying, but standard for Poland. Then we come to a closed road and Peter starts freaking out. This is the only way he knows how to get to Zyweic and the road is closed. Peter jumps out of the car, sprints to a construction crew member and gets different directions. We are then reversing on a two lane highway and turn onto a road that barely even fit our van. Peter is now putting the pedal to the medal because we are about to miss the last scheduled appointment of the day. I have my head between my legs, freaking out, and Peter assures me he is a race car driver so it’s fine. Meanwhile we are climbing up the steepest mountain I have ever driven on, just to go FLYING down the other side. Kelli and I finally asked if he’d done this tour before. No he says, this is the first time in tour years anyone has requested this tour. Of course, Kelli and I just look at each other and say oh boy. So we get to the tour and I don’t even know if I can explain this experience. We never actually saw the brewery. The brewery tour here consisted of a very nice museum. However, this is not your average museum. Here you go into a dark room, which is supposed to be a time machine, the floor beings to shake and there is literally a woman counting down to the year the brewery was formed. You walk out into this place that is decorated like the 1800’s. There is shops and over speakers there is the noise of how the city would said. The whole tour is this weird. At one point we were bowling and at another Kelli and I were in a room where there was a tv on the ceiling with a video trying to simulate being in a World War II bombing. It was such an experience though. We loved Peter. He was our age and it was fun that he had never been on the tour either. The whole tour was in Polish, so thank god we had him to translate some things into English. Peter loved us too. On the way home we even stopped at a miniature monuments park. The tour was 8 hours long! Crazy. Such a fun experience though. The next day Kelli and I left for Zakopane. It is there resort town in Poland that has a ski area in the winter. The Tetra Mountain range is there. Kelli and I found the bus to get there ourselves and rode the two hours there. I had the grand idea of following the map and walking to our hotel. About an hour and a half later and a broke piece of luggage we made it there. The next day we decided to go check out the main mountain that is 2,000 meters, 6,500 feet tall. There is a cable car that Polish people take up and walk down the mountain. Both Kelli and me are a tad exhausted and we see that the line for this cable car is about 300 people deep. That’s just not going to work for Kelli and I. So we were like, why don’t we just hike around a little. We at this point have no idea how tall this mountain is or where the trail we just start walking on leads to. The first hour was great, we feel great for hiking and being productive, but all the sudden it starts to get steep. We come to about the half way point and I am determined now to get to where the cable car ends. After an hour and a half and literally walking straight uphill we arrive at the very peak of the mountain. Just stunning views. It was so worth it, but Kelli and I had not prepared for a 3 hours hike like this. Neither of us had eaten, we had no water the whole way, and were not prepared at all for rain. Thank goodness it literally started raining the second we got to the top. It was another experience where Kelli and me just look at each other and laugh. Only in Poland. And yes, we did take that cable car down and I was totally freaked the entire way. That night we had an amazing dinner with the rest of the program. We got a platter for eight full of every kind of meat imaginable. In addition we got mass amounts of the best cheese around. It’s called mountain cheese and it comes from the Zakopane area. I would recommend it, but you’d have to come to Poland for it because they don’t sell it in American. Zakopane was a great place. I will always remember that hike and the meat factory meal. Delicious. Time seems to be flying by. I am two weeks into the Krakow program and totally exhausted. Krakow is an amazing city. Although there is 900,000 people in Krakow, it still feels very small. I’m living in a hotel called Zaczek, but it’s known by a lot of people as the student dormitory. Tons of students live in these dorms throughout the school year. We actually have 1/2 Americans and 1/2 Polish students in the program. The Polish kids are great though. They show us around and are really helpful. Some of them are actually from Krakow, so they know all the cool places to go. The first day here we toured around the city and got a feel for where our classes would be located. The classes are taught by Polish teachers, although one is from Catholic. Most of the time it’s very difficult to follow. They just phrase things differently and their accents are really hard for me to follow. We have class from about 11:00 to 3:45ish everyday of the week. We have about an hour in there to go grab lunch and frantically try to catch up on our reading. People in Krakow are almost living in the 1980’s still. Lots of guys have mullets and everyone rollerblades here. Like everyone. You can actually rent them, which I will be doing. There is a huge park out front of the Zaczek which I’ve been running around. I shockingly have been running almost everyday. Sometimes pretty far because I’m exploring the city. There is a river that goes through the city and there is a path next to it. I’m always surprised at the amount of people who exercise here. Nothing like Rome. It’s dirt cheap here, which is a great change from Rome. I can go out to eat and order almost three courses and beer for $20 bucks. It’s amazing. Beers are $2-$3 dollars. And they are strong. And man do the Polish like to drink. They go out and the bars literally never close it’s crazy. Vodka is their drink of choice. They just do shots of vodka. One bar had a minimum for shots, you had to buy in quantities of 4. Polish girls also dress very provocative. I mean skin tight clothes, see thru shirts, and poor excuses for skirts. Needless to say, the boys are loving it. This week one of our Polish friends had us over to her house for the National holiday. This holiday was on Thursday, so we actually had no class. She lives in an awesome apartment. Then she took us to a local watering hole (an old quarry filled with water) that was amazing. We did cliff jumping from 30 foot cliffs. It was amazing. It was the most fun I’ve had in a very long time. Just swimming and enjoying the weather. So far things are great here. Never thought I would study abroad in Poland, but I am so happy to have this opportunity. It’s been great so far. Now only one week until Kelli comes to visit and 4 until I see my boyfriend. Missing everyone! Well, I’m approaching the last couple days of my time in Roma. I have finals on both Friday and Saturday, so sadly I’m forced to spend my free time in the last couple of days studying. I leave for Krakow immediately after my Saturday final! The past week has been a busy one, much of which was spent eating pasta, pizza, and walking around Rome. We also have been studying hard, which is has been no fun. It’s funny, everyone tells me there study abroad was so easy….of course, at CUA we have had a much different experience. I have over a 100 pages of textbook reading a night! And my teacher actually expects us to have time to memorize for our test…when we have our last class the night before. We went to Florence this weekend for just Saturday. We left on Saturday morning at 6:45 on the express train and got there very early in the morning. Like 7:50am. We randomly started walking around the city and saw a line near Santa Maria del Fiore, so we decided to get in. Turns out the people in front of us had gotten up at 6am to get in line to go up The Duomo, which is the dome. We really lucked out because we didn’t even have to wait, we went to the top, and saw the most amazing views of Tuscany and the city of Florence. We came across a farmers market that only happens once a month, which has tons of truffle cheese samples, and truffle pates and spread, with wine and olive oil. It was amazing and I was in heaven. Then we had the most amazing sandwiches of my life. I will forever crave them and may be going back to Florence just to have one. I had turkey, truffle pate, and mozzarella cheese, which they melt on a panini press. To die for. We continued to luck out because then we randomly saw on a poster that there was a Tuscan wine festival that day. We went and tried so many different red and white wines from Tuscany. Each wine maker would tell you all about the wine and why there’s was special. You paid EUR 10 for 10 tasting, but not one of the would stamp you ticket. They insisted wine tasting should be free. So we probably had a little more than 10…opps. For you reality tv junkies, we did get pizza from the Jersey Shore pizzeria. We saw all of them except Snookie. I was not quite as into them as everyone else since I haven’t once watched the show, so I did not fill out the 30 page contract to allow you to go into the pizza shop, but my friends did. And brought the pizza to go. We all had a piece and can now say we ate pizza from the Jersey shore cast. We actually did that on the way to dinner, yes…I’m the ultimate fat kid in Italy. We ended up going to Aqua al 2, which we have in DC. And, the blueberry steak is to die for. The last week was filled with a lot of studying and eating. Rome went by so fast. I am sad to leave, but the rate of EUR to the dollar is telling me it’s time to go. Funny how I spent so much money in Rome and I have nothing to show for it. It was all about consuming in Rome. Off to Krakow! More later…. Capri is an amazing resort island off the coast of Amalfi. You can reach Capri only by ferry or your own boat. Capri is known for its linen and lemons. The town of Anacapri can be reached either by bus or claiming the 1,200 Phoenician steps that start near the Marina Grande. The bus ride is a beautiful exciting ride. You feel as though one wrong turn will land you in the ocean below. Anacapri has the best shopping on the island if you’re not looking for the high-end stores. There is also a chairlift in Anacapri that will take you to the highest point in Capri, which is a speculator view and well worth your time. The best place to eat and lay out is in Mariana Piccola. It’s the quieter side of Capri island and has great restaurants right on the water. Don’t forget to have a caprese salad with every meal. They are amazing. Well, I’m the world’s worst blogger!! It has been crazy how busy I have been since I arrived in Rome. The travel over to Rome was a little exhausting. I took the metro to the flyer, the flyer bus to Dulles, stop over for 4 hours in London Heathrow, then arrived in Rome, took a train to termini and a metro to my new home for the next three weeks. I was trying to be a savvy traveler, but it was a lot of work. With the 900lb. backpack and the 40lbs. of law school books, I am definitely going to have back problems when I’m older! The dorms here are sparse, but just fine. I have a great roommate who I pretty much do everything with. It’s always better go travel around Rome and go out to eat with smaller amounts of people here. The Italians are always telling the Americans to be more quiet and they just hate when I big group of Americans walk into their restaurant. On Sunday, the day after I arrived I went to mass at St. Peter’s. Then we went out to the plaza and saw the Pope. He comes to his bedroom window and waves at a crowd of thousands of people who gather in the plaza after mass. It was crazy. In the crowd we did manage to spot Joe Montana and his wife!!! You’ll see a pic of the back of his head. That’s all I could get! Then food here has been amazing. I am pretty much on a carb only diet. So, we shall see how this works out for my figure. We walk a ton though and my roommate and I are even running! Italians just smoke and watch us run by thinking…Americans are crazy. Classes are interesting….and totally get in the way. We have about a 100 pages of reading, so no they are not taking it easy on us just because we are in Rome. I just have to wake up at about 7am to read at the bar in the morning. And no Mom, not a real bar…it’s just what they call the cafes here! Make sure to check out the pics!!! 2. Return spaghetti to warm saucepan. Stir butter into hot pasta until melted. Stir in egg and parmesan cheese; set aside. 3. Meanwhile, in a medium skillet cook ground beef, onion, sweet pepper, garlic, and fennel seeds until meat is brown and onion is tender. Drain. Stir in tomato sauce and oregano; heat through. 4. Coat a 9 inch pie plate with nonstick cooking spray. Press spaghetti mixture onto bottom and up sides of pie plate, forming a crust. Spread cottage cheese on the top and up the sides of pasta crust. Spread meat mixture over cottage cheese. Sprinkle with shredded mozzarella cheese. 5. Bake at 350 for 20 to 25 minutes. To serve, cut into wedges. Although this looks like a big pile of cheese, this is the classic spaghetti pie. I hadn’t eaten this dish since I was little so I thought I would try it again. Since I’m all packed up, I have limited resources. I didn’t have a pie dish, so I ended up doubling the dish and putting it in a standard casserole dish. This dish was delicious and makes enough to last for almost the whole week. Next time I’ll take a picture of a slice since this isn’t very representative of what is in the dish. I’m sure you are wondering if I’m going to be one of those bloggers that posts only one a month. Let’s hope not. I was busy finishing up with finals and getting ready to leave for the summer. It’s amazing how much you have to do in order to prepare!! I will try my best to be better from here on out. Last day on the job…. Today is my last day of work on Capitol Hill. It is hard to close this chapter of my life, even though I have such exciting things planned in the coming months. I almost feel like I’m finally just graduating from college and I have to grow up. My job was the best job anyone could ever have out of college. And, who knows, maybe I’ll be back sooner than I think:) I have no idea what lies ahead of me. I do know, I will miss my office, my friends and the atmosphere of working on the hill. I will miss my little fishbowl, sitting in front of two of my favorite people. They will no longer have to suffer through my endless personal calls…which I’m sure they are thankful about. I definitely won’t miss walking through metal detectors everyday. Call me paranoid, but I swear one day they’ll come out and say those cause cancer. Along with everything else though I suppose. I will also enjoy wearing heels without having to do an awkward leap/jump/long stride to get into the office building. I swear it’s just a big joke between the Cap police. They need some sort of entertainment while standing there all day. Next up, finals….then off to Rome!! This weekend I went to the Outer Banks in Corolla, NC; better known as OBX. A group of us generally go once a year either over Easter weekend or Columbus Day weekend. This year we were lucky Easter was so late because it was HOT. Legend has it, it’s supposed to take 5 1/2 hours to get down there, but with DC traffic I’ve never made it under 7 to 8 hours. I left at 5pm on Thursday and didn’t get in until midnight. I also managed to get pulled over in Duck, NC…about 10 minutes from Katey’s house at 11:40pm. The cop actually pulled a U-turn just to pull me over. I think he was hoping I was drinking and driving, but sadly I was sober and blasting through the “town” at 45mph. I had no clue there was a strict 25mph speed limit. Opps. Lucky for me, he let me off with a warning. I think he felt sorry for me because I had been driving since 5pm that night. The house we stayed at is my friend Katey’s. Sadly, her parents sold it this month, so this was the last trip we could take advantage of her amazing place. We had about 20 people staying there this year (the house actually sleeps that many). It’s quite a scene when you arrive. There is not too much to do in Corolla. I ran on the beach everyday. You can also drive on the beaches there, so we took Cary’s Jeep Wrangler on the beach to go find wild horses. I actually saw a little baby colt this year! There is also a couple golf courses and tennis courts, but I had to forgo those this year. The night life is exciting/interesting. Always an experience. Generally we go out at least one night to sing karaoke and converse with the lovely “townies” of Corolla. Well, last night I thought I would try something more simple. 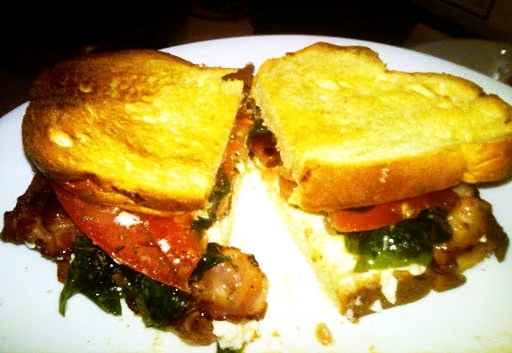 Turns out, this BLT was a little more difficult and expensive than I thought it would be. I went to Whole Foods because I was sure they would have burrata cheese. For those of you not familiar with this cheese, it’s mozzarella mixed with ricotta. It came wrapped in banana leaves. It’s not cheap though, it was $10.24 for 9oz. You have to wait 30 minutes to an hour before making the meal, so we went to have a drink at our local watering hole. The BLT was good, it’s just that wasn’t $24 and 2 hours prep time good. My opinion may improve I had used regular bacon to give the sandwich the extra flavor it was missing. -Meanwhile, using 2 forks, shred the pork and stir into the cooking liquid. Serve with the tortillas, cilantro, sour cream, lime, and extra salsa. Overall, I thought this was an awesome crock pot meal. We ate it with low-fat 6" whole wheat tortillas, which only have 45 calories a pop. I would definitely recommend this dish for the busy professional and for guys who own a crock pot. This is a Whole Foods Recipe. The meal felt healthy. It was maybe a little on the bland side, but a good meal for a Sunday night when you are just wanting a simple, but healthy recipe. I served this with Israeli couscous from Trader Joe’s. I prepared it with a bay leaf, 1/2 cup shallots, 1/2 Tbsp cinnamon, 1/4 teaspoon parsley, and 1/2 toasted pine nuts. Delicious. Preheat oven to 350°F. Toss chicken pieces with olive oil and half the tarragon leaves. Season liberally with salt and pepper and toss well to make sure all pieces are evenly coated. Arrange onion slices in the bottom of a baking pan or oven-proof Dutch oven large enough to hold chicken pieces as best as possible in one layer. Sprinkle remaining half of tarragon leaves over onions and arrange chicken on top. Add chicken broth and lemon juice, cover with a lid or foil and place in the oven. 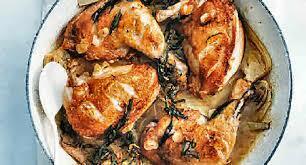 Bake for about an hour or until juices run clear when chicken pieces are pierced with a fork. Remove from oven, covered, and let rest 10 minutes. Just before serving, taste the juices at the bottom of the pan and adjust seasoning with salt and pepper. Serve chicken with juices spooned over it.